Giordano’s philosophy of “World Without Strangers” transcends its origins and develops enduring trust and strong relationships with consumers across all borders and cultures. The essence of Giordano is to provide relevant, essential and timeless fashion for all; and to develop apparel for everyone regardless of ethnicity, nationality or culture. Our products incorporate the latest innovations in fabric technology, ensuring superior quality and great value. Giordano is a brand for everyone, everywhere. 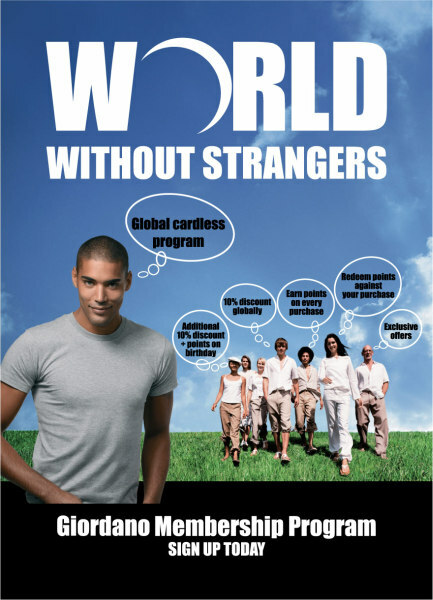 The brand launched its WWS – World Without Strangers-it’s global and card less loyalty program in 2007 with the objective to reward its loyal customers. The USP of this program is its global presence, the simplicity of its usage and your mobile number being your personal identification or membership number. Customers are able to get discounts and accumulate points on every purchase they make and can also access their information online and on their mobile phone. The Program has received a tremendous response since its launch and today has over 350,000 registered WWS members in the G.C.C. and over 8 Million globally.